The detective struggles with his own troubled past and is determined to find the truth behind the shadows dimming Natasha's eyes. As more murders occur and a possible connection to her ex-husband appears, Chase fears her life is in danger. The thick carpet muted the tapping of her high heels as she fled through the reception area and down the hall to the elevators. She glanced down a short corridor on her left and stumbled to a stop. How had she missed the ropes of yellow police tape blocking the entry to one of the rooms? Her breath hitched in her throat. That must be where the grisly crime had occurred. The shocking truth struck her like a blow—Jonas Waverley was dead. Murdered in cold blood. She staggered and grabbed onto the wall. Detective Brandon strode along the corridor toward her, his long legs eating up the distance, a determined expression on his face. Her earlier spurt of courage vanished, and she whirled and dashed toward the bank of elevators. Chest heaving, heart pounding, she hit the button for the elevator, jabbing it again and again. She shuddered and stabbed the down button again. Person of interest? Her? She was a person of interest in a murder investigation? A whimper escaped her mouth, and she drew her knees to her chest in a protective ball. He chuckled, though mirth was absent in the chilling laugh. “This is your fault, Natasha. You pushed me too far. You know how upset I get when you’re contrary.” His furious gaze seared her like a fresh blow. She curled into a tighter ball, protecting her stomach, covering her head with her arms. “Well?” He nudged her thigh. “Okay. I’ll do what you want. Just stop hurting me. Please.” Her stomach twisted at the whine in her voice. She hated this. Hated the way he seeped into her soul like a vile poison and destroyed her self-respect. Hated how she cowered before him, willing to do anything to stop the pain. Hated him. Hated herself more. He crouched beside her, and his long, thin fingers with their glossy, manicured nails connected with her cheek, caressing her skin. She closed her eyes, refusing to obey, determined not to give in to his command, fighting to regain the tattered remnants of her dignity. 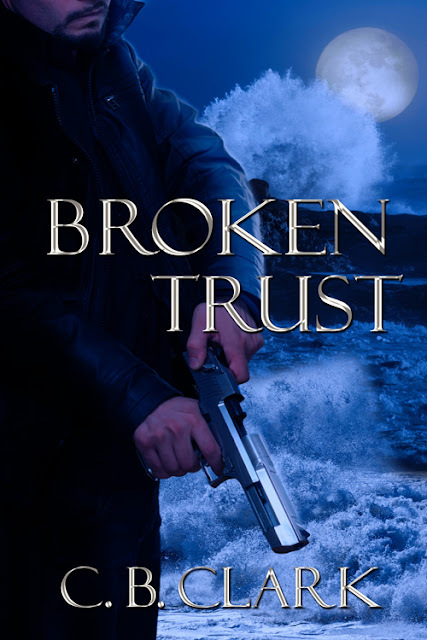 Broken Trust is award-winning author, C.B. Clark’s fourth romantic suspense novel published by The Wild Rose Press. My Brother’s Sins and Cherished Secrets were released in 2016, and Bitter Legacy in 2017. C.B. has always loved reading, especially romances, but it wasn’t until she lost her voice for a year that she considered writing her own romantic suspense stories. She grew up in Canada’s Northwest Territories and Yukon. Graduating with a degree in Anthropology and Archaeology, she has worked as an archaeologist and an educator. She enjoys hiking, canoeing, and snowshoeing with her husband and dog near her home in the wilderness of central British Columbia.